We love tacos at our house and they show up almost weekly on our menu. I’ve shared my steak taco recipe before…..below is its close cousin, chicken tacos. Yum! ****edited: lately I’ve been skipping the taco seasoning and just using the salsa….a little less flavor, but just as good! 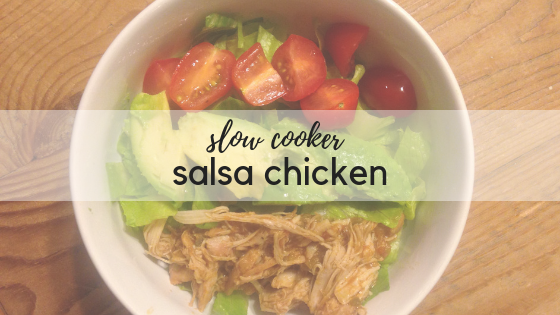 Pour jar of salsa into the bottom of your slow cooker. Add 2-3 tablespoons of taco seasoning and stir well. Add chicken breasts and toss to coat. Cook on low 8-10 hours, or on high 4-6 hours. Shred chicken about 30 minutes before serving and let simmer in juice. Serve in your favorite taco shell, tortilla, over chips, with cauliflower spanish rice or in a lettuce wrap. Enjoy! I can’t get the taco seasoning recipe to come up, could be user error but can you repost it?